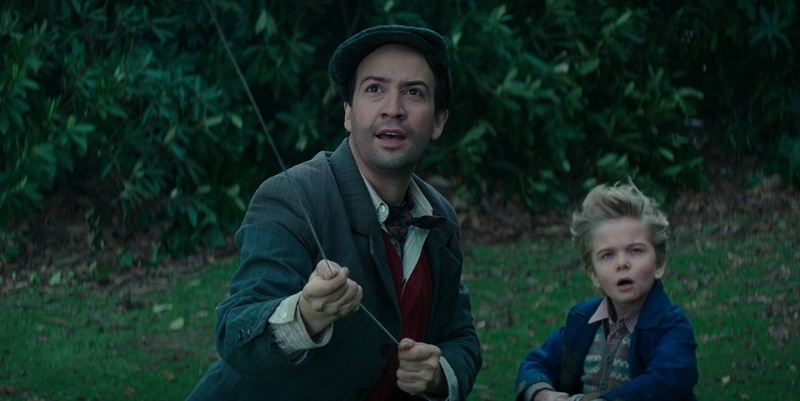 Lin-Manuel Miranda Takes On The Role Of Jack In Mary Poppins Returns. Lin-Manuel Miranda y’all! 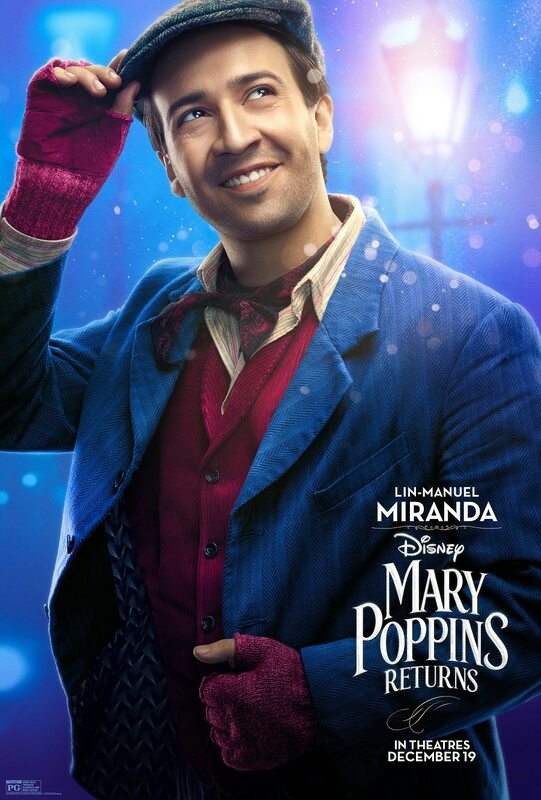 I could not think of a more perfect Jack for Mary Poppins Returns than the Lin-Manuel Miranda. What an amazing interview. 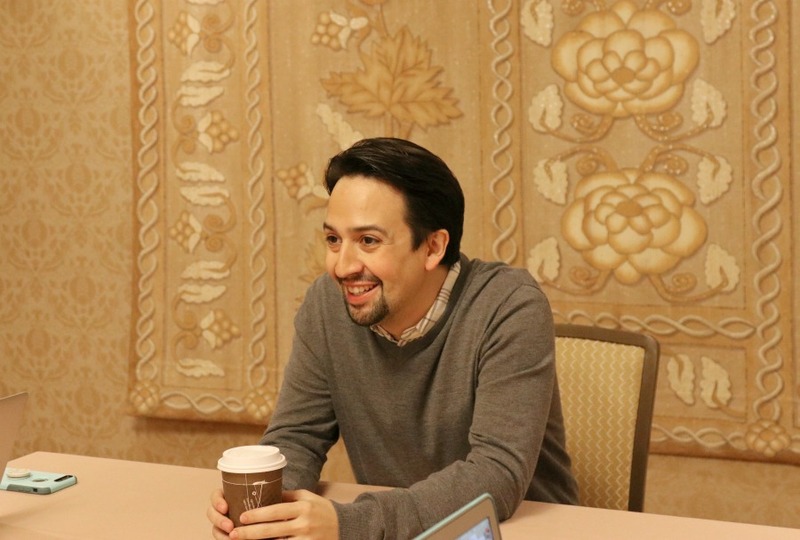 I don’t know if y’all remember, but I interviewed Lin-Manuel Miranda a couple of years ago for Moana and I am a a huge Hamilton Fan. Getting to be in the same room with him again was nothing short of miraculous and magical! When he walked in the room, the room got a little bit brighter. I could have sworn there was a sparkle in the air. Lin-Manuel Miranda is such a humble man and it just pours out of every word that he speaks. The day we interviewed him, he was fighting laryngitis, so there was no break out rapping session (boooo). We had so much fun, even without the singing and dancing. 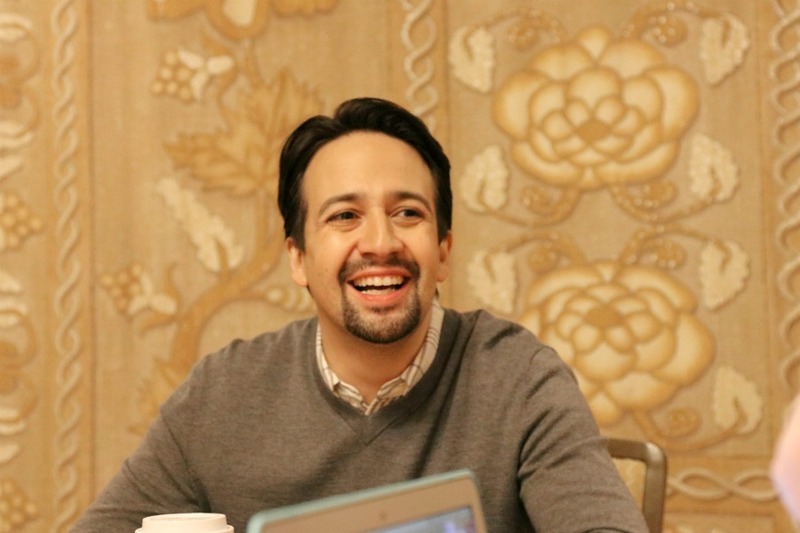 From the moment Lin-Manuel Miranda sat down to chat with us, the energy was amazing! 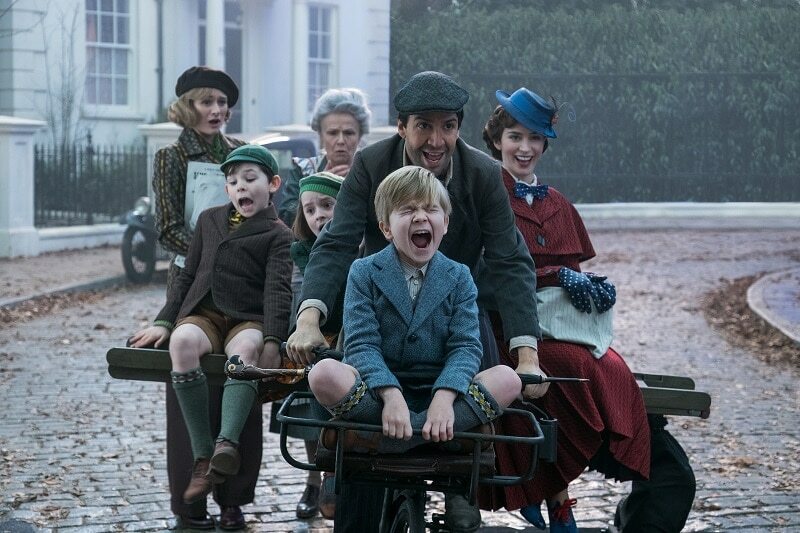 Sit back and relax as you read about how his role as Jack in Mary Poppins Returns evolved into something more magical than, even he, could have imagined. How was it doing Mary Poppins Returns? Lin-Manuel Miranda: It is the fruit of the harvest. No, honestly, I started writing In The Heights because I very quickly realized at age eighteen that no one was gonna write my dream musical. That I did not have the ballet training to play Bernardo in West Side Story. Or Paul in A Chorus Line. And if you’re a Puerto Rican dude that’s all you get. So In The Heights really was the beginning of creating my own opportunities. Hamilton is an extension of that. Then to have Rob Marshall call you and tell you it’s Emily Blunt as Mary Poppins and you’re the only other person we have in mind and we’re gonna build from there. It felt like the fruit of the harvest. The harvest I began when I was eighteen years old. 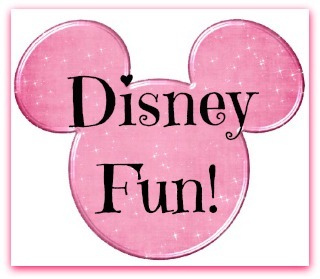 How is it different being in musical theater versus starring in a musical movie production? Lin-Manuel Miranda: You finish the eight minute dance number and you wait a year and a half for applause. But honestly, you’re trying to tell the truth on stage and you’re trying to tell the truth in film. The difference is the energy source. Doing eight shows a week is a yoga. You’re gonna hit the same positions every night but you’re gonna hit them differently depending on your energy, the audience, you’re fellow performers. And you have two the next day. The energy source in making a film is, especially a film like this, today you’re dancing with penguins. Tomorrow you’re singing with Meryl Streep. Friday you’re shutting down Buckingham Palace with 800 bikers and you’re not coming back. We’re not going back to the penguins next week. You don’t get two shows a day with Meryl Streep tomorrow. So the adrenaline source becomes this is a once-in-a-lifetime moment and you have to be completely present. It just shifts from the audience to the sheer one-of-a-kindness of it. Lin-Manuel Miranda: That’s a great question. There are so many scenes I’m proud of. It’s funny. There are scenes I’m proud of because they’re my own fault. There are scenes I’m proud of because they took so much practice and mastery. Tommy Kail, who directed Hamilton, said the he was most moved when he saw me slide down the bannister in ‘Trip A Little Light Fantastic’ because that’s like the one thing I actually know how to do really well. As Tommy Kail put it, ‘You don’t know how to land a joke or sing a note or grow a beard without practice. But man you were born to slide down banisters.’ And then there are moments that represent hours and hours of hard work from the eight minute, continuous dance sequence in ‘Trip A Little Light Fantastic’, and Rob ran it as an eight minute dance sequence. There were sort of the three minutes of the song that are getting to that abandoned playground, and that was on location throughout London. And now we’re here, and now we’re in the sewer, and now we’re here. And then there’s that sequence. And that sequence was run as if it was a Broadway musical number. From jumping on the lamppost to the flaming sticks balancing on my foot, that was all run of a piece with hundreds of cameras around. I’m very proud of that. I’ve never danced like that in my life. Did you find the costumes comfortable or uncomfortable, especially with dancing in them? Lin-Manuel Miranda: Yeah. Well, Sandy Powell’s a wizard and she’s sort of a Mary Poppins herself. She looks not of this world. She comes in with this orange hair and these amazing outfits. The next thing you know, you’re wearing an amazing outfit, which is very Poppins-esque. Dancing was always given priority. So, even in those hand-painted suits in the Royal Dalton Ball and that is painted, that is like acrylic paint on the suits, there’s give and there’s stretch in the pants so we can sort of do our work. Do you remember the first time you saw Mary Poppins and what that meant to you? 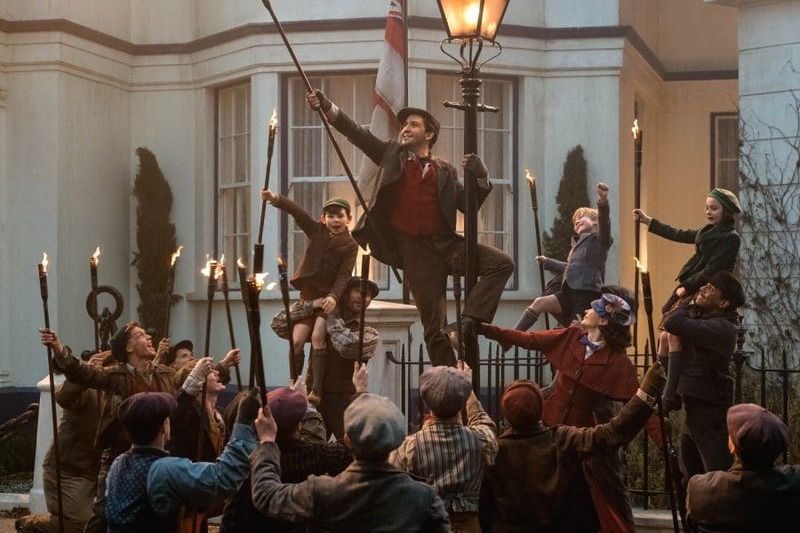 Lin-Manuel Miranda: I remember seeing the first two-thirds of Mary Poppins. We had the V.H.S. cassette and it was, some of you will remember this. They had their own section in the home library because they were fluffy and white, a little bigger than your shelf. And then I remember turning it off during Feed The Birds. Feed The Birds is the most emotionally devastating melody in the history of cinema. I was not ready for it as a kid. So I remember crying and turning it off. I didn’t see the end of Mary Poppins until I was like in high school because that song was just too sad. It was just too sad for my tender little heart. And so yeah. So I remember the first two-thirds of it on repeat. And then Feed The Birds was like, ‘Oh, okay, I’m gonna go play’. That was my experience growing up with it. 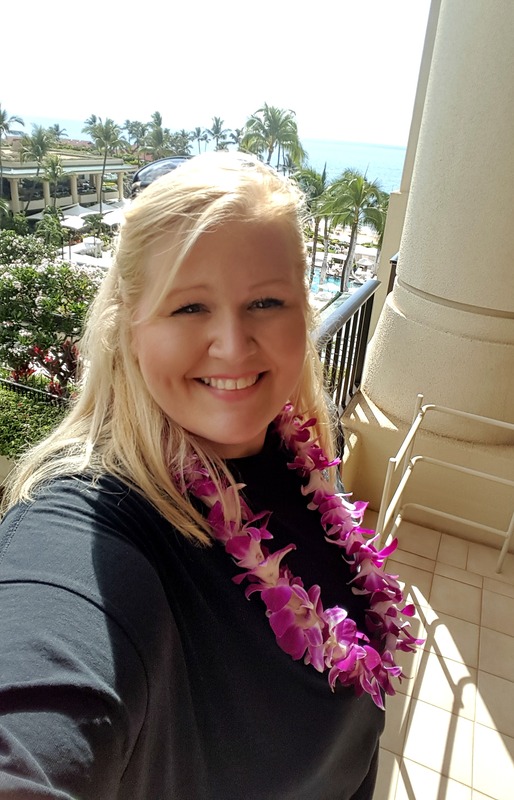 How do you feel that you can inspire children, your son, that everything is possible? 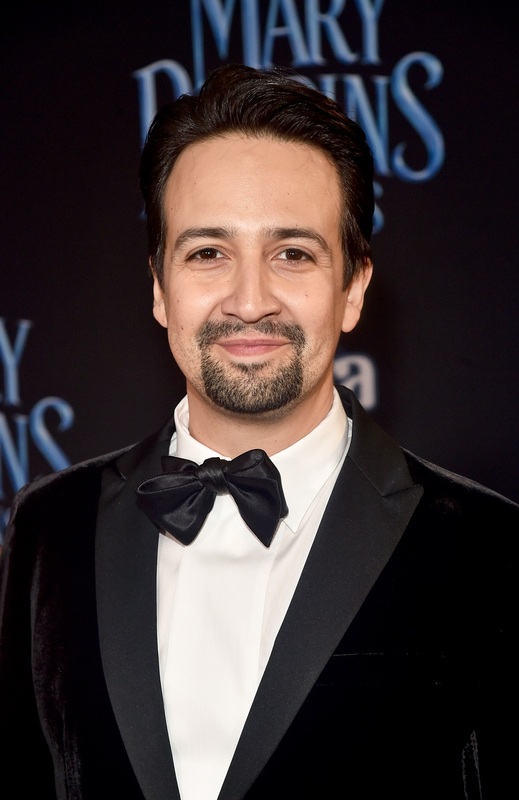 Lin-Manuel Miranda: I was inspired by him. We started making this movie right when my son was turning two. He was just gaining language. And, you know, my character really the biggest note Rob Marshall gave me is that all the other grownups forget what it’s like to be a child except for Jack. So my biggest research was watching my son play in Princess Di park in Kensington Park in London, watching his boundless imagination. We are all born with that. I think that’s inherent in us until life does what it does. And so you know, that was my secret weapon in finding Jack was I had a two-year-old research assistant who kept me childlike and kept me in that mode. Lin-Manuel Miranda: With Meryl Streep? I mean, every day with Meryl Streep feels like you’re in the upside down. It’s like, how is this my life? How are we on the ceiling? It was a joy. I mean, I think, that’s the sequence that I think that I watched the movie I watch it more closely every time because it’s a triumph of production design, the way every ceiling element becomes a floor element. And then Meryl, you know, I talked to Emily Blunt about this. She’s done three films with Meryl. She’s gone from being her assistant to being the lead of the movie. It’s been kind of an incredible product. What Emily told me going in was that like Meryl just kind of stays in the character, but not like method Daniel Day Lewis cobbling shoes. Like she’s just kind of in the spirit of it. And I felt so lucky that she was in the spirit of a character that’s so mischievous and flirty and fun. I’ve told this story before but there’s one moment between setups where she just looked at the kids and went, ‘Hey kids.’ I can’t do Meryl. Emily can do Meryl. She goes, ‘Hey kids, you wanna know how to do a pratfall?’ And she went… like from standing to face down. Everyone runs in like, Meryl Streep has died. She gets up, she goes like this and she goes, ‘learned that at Yale School of Drama.’ And it was just to show off for the kids. And so I was very grateful that I got to play with that version of Meryl Streep.